Leading on from my last summer-themed blog post (which you can read here), I'm bringing you another summer related blog post, because the weather is just so surprisingly good here in Northern Ireland and it's been putting me in a super summery mood! 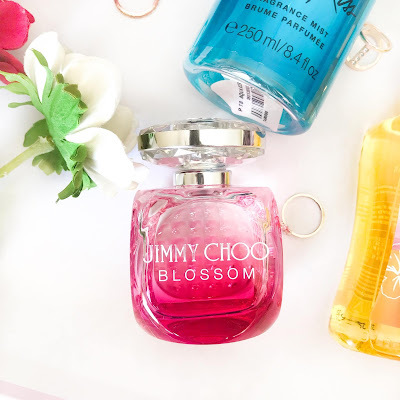 I'm going to be bringing you 5 summer fragrances that I absolutely love and think everyone needs to have a little sniff of, so I hope you enjoy! I love a good perfume at any time of year, but I especially love summer fragrances, because they're usually fruity and floral, which is my fave type of scent! All of these fragrances not only have gorgeous summery-looking bottles, but they're just completely perfect for this season, so if you're looking for a nice new summer scent for 2018, keep on reading! I think just about everyone has had a Victoria's Secret body spray in their possession at some point. I currently own 4 and am always wanting to expand my collection, because I find that they all smell amazing. I don't think I've ever found on of their fragrances that I didn't like. Aqua Kiss is one of my faves because not only does the colour scream summer, it just smells super refreshing, fruity and light. It's just one of those fragrances that I want to constantly spray all day. If you're looking to pick up your first VS body spray, or maybe just another one to add to the collection, I would definitely recommend this one - I know a lot of people have this as their fave! This has got to be one of my all-time favourite perfumes. It's one that I'd gladly wear every single day if I was only allowed to have one perfume for the rest of my life. The packaging is so stunning, with a glass bottle and a pink ombre effect. Blossom has a light, fresh and sweet scent which I absolutely love. I was dying to try out these Hawaiian Tropic fragrance mists when I spotted them in stores last summer, as they all have gorgeous colourful bottles and look perfect for summer. I think they have 4 or 5 of these, all in different colours and with different scents, and I’m dying to just have the whole collection! They all smell amazing, but I decided to pick up this one as I love anything with a coconut scent. Golden Paradise smells exactly like holidays to me, as it has a scent reminiscent of suncream, so it just reminds me of lying on the beach in a gorgeous country, on a lovely hot day. I got mine in a mini size which is perfect for carrying with you on-the-go, so you can spritz it on at any time. I’m sure everyone has, at some point, either owned or at least sniffed, a Marc Jacobs perfume. I’d say that in my opinion, they’re the most iconic perfumes out there because there’s so many different ones, each with a stunning and amazingly-designed bottle. Marc Jacobs definitely wins the prize for the most adorable perfume bottles in existence. I have a few of his famous scents, but I chose this one for this post, as the colours are very summer-esque and the scent is very light, fresh and floral. There are so many different variations of the iconic original Daisy perfume and they all smell amazing, but Daisy EauSo Fresh Delight is definitely one of my favourites. 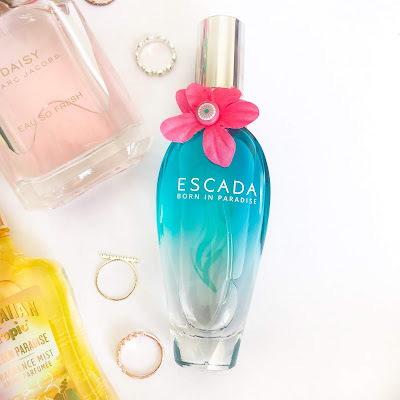 Escada perfumes always scream summer to me, because they always have gorgeous packaging with bright tropical colours and images. Even the name of this one just envelopes summer and of course all the gorgeous scents included make up a beautiful fruity summer cocktail. The scent is sweet, light, fruity and fresh - perfect for day or night. I love the little touch of the fabric flower wrapped around the top of the bottle as well, adding to that paradise vibe! What are your favourite scents during summer? Do you just use the same ones all year or do you gravitate to certain ones when the sun comes out? Let me know in the comments! I'm obsessed with the Marc Jacobs perfume bottles! They're just so pretty! 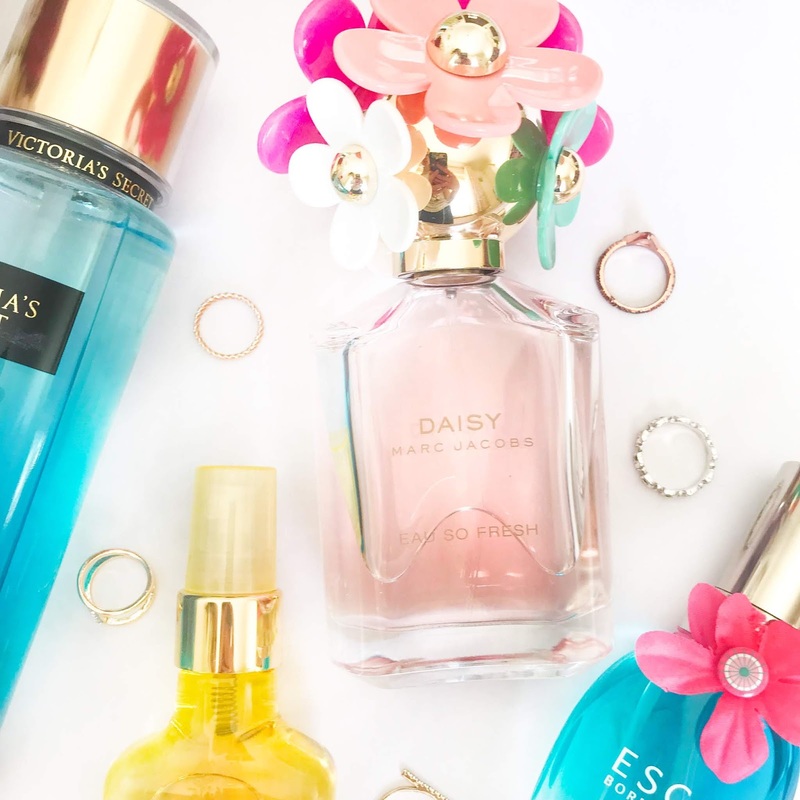 Loved this list of summery perfume scents! I love fruity fragrances. I have this peach scented perfume that I use constantly! Great post! Love these fragrance choices! I'm looking for a new fragrance to switch things up. VS always have nice mists. The Marc Jacobs one looks so cute. Thanks for the recs! I didn't even know Hawaiian Tropics sold fragrances! I was convinced they only sold sunscreen - that being said, I think their little fragrance definitely caught my attention since I love all things tropical! Thanks for sharing! I love the Marc Jacobs perfumes purely for the bottles! I've never owned one myself but my Mom has a few! I really want to try that Hawaiian Tropic one now as I love coconut scented things too! Thanks for the recommendations I'll keep my eye out for these! ooo im a massive fragrance lover - in the warmer months I'm quite drawn to Calvin Klein - Beauty. I love Marc Jacob's Daisy! it's my soul scent haha. But I've been hearing good things about Hawaiian Tropic mists - will have to check those out! I have to try the Jimmy Choo scent! I tend to gravitate towards light, fresh and sweet scents and I'm a sucker for Marc Jacob's perfume - never had one with pink peppercorn and grapefruit undertone. Gorgeous photos in this, i feel like any kind of PINK or victorias secret scent is perfect for summer! 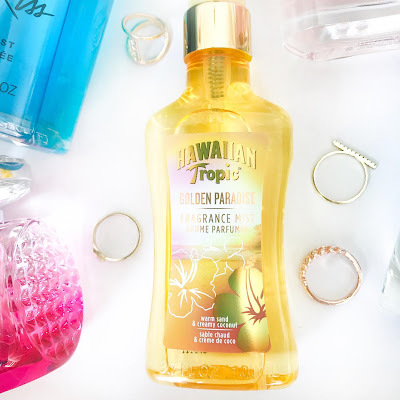 I've not seen the Hawaiian Tropics spray's about I've used and loved their sunscreens and Golden Paradise sounds incredible definitely checking this out. Thanks for the recommendations. Out of all of these I have to say that the Victoria Secret fragrances are my favourites! I love Marc jacobs perfume, it's so exotic! 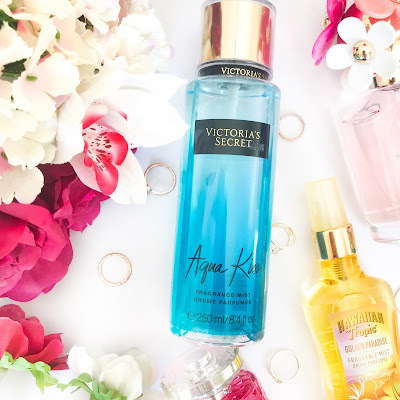 I'm reeeally picky with fragrances, but I love the Victoria's Secret ones - just as well as I can't actually get any underwear from there! Marc Jacobs daisy is one of my favourites! Great post! May have to treat myself to some new body sprays! I absolutely love the body mist from VS, the one with a coconut scent? Gosh, can’t remember what it was called! It’s definitely my go-to :-) these sound so lovely! All of these perfumes sound so refreshing ! I love a good body just too because it's great for those easy, laidback days when you need a pick me up. The Blossom one probably sounds the best to me. Thanks for sharing! The Marc Jacobs - Daisy Eau So Fresh Delight sounds like something I would love. The perfect summer perfume! Lighter botanical Kerry Washington Skin Care fragrances are adequate to nearly everybody. Heavier perfumes with oriental notes are progressively dangerous.